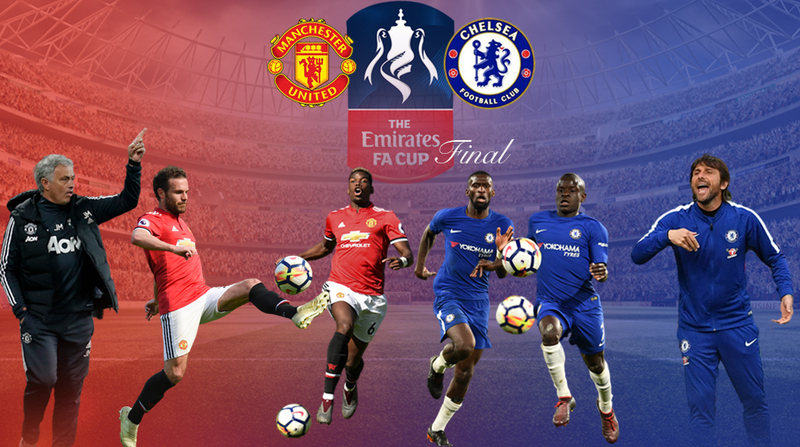 Manchester United face Chelsea in the final of the FA Cup of this season. This is the last game of the season and to cap the season with a trophy will be a great way to end an average season for us. The next season is a do or die for Jose Mourinho and no more FA Cups or League cups will do next season. We have to start aiming for the Premier League and the Champions League. Anyway, onto the finals. We take on Chelsea at Wembley after they beat Southampton and we saw off Spurs in the semi finals. Conte and Mourinho will refresh their rivalry that taken plenty of twists and turns since the Italian came to the Premier League. With Conte and Mourinho both winning one game apiece against each other this season, both will look to get the upper hand with a trophy on the cards. Chelsea have disappointingly finished outside the top 4 and will play Europa League football next season. There is widespread resentment and discontent among the Chelsea fans and the board as well. Conte has openly slammed the board on numerous occasions for not having the support of the board and the last few games have shown a major disinterest in general. In their last three games where they needed nothing but a win to secure top 4, they drew to Huddersfield and lost 3-0 to Newcastle on the closing day of the season. However, we will be foolish to think that this finals will be easy due to their current form. When two teams from the top 6 face each other, forms goes out of the window. The same thing will happen on the 19th. We can expect Chelsea to turn up against us. Their new signing, Olivier Giroud, will be a handful for our centre backs and their defence can be pretty stubborn too. Jose Mourinho seems to have a way of tackling the threat posed by Eden Hazard and I'm curious to know what he'll use this time. It will be a tough contest but I'm sure we can win if we play the way I know we can. For the starting line-up, David De Gea returns to his place in goal after he was rested for the Watford game. Predicting the back four will be tough but I think we will play a centre back pairing of Smalling and Bailly with the usual full backs. The defence needs to be really well oiled for a finals and Jose is a master of that. I loved how we very tactically shut a youthful Ajax side down in the Europa League finals with a defence of Jones and Smalling. In midfield, we should go for the usual Matic, Herrera, and Pogba. McTominay tamed Hazard the last time the sides met so he seems to be a good shout as well. Also because Jose treats him like a son. But I'd rather go for the aforementioned midfield three. Upfront, a front three of Sanchez, Lingard, and Lukaku should do the trick. Sanchez and Lingard absolutely love Wembley and it would be stupid to leave either of them out of the squad. Lukaku might have fitness issues. If he does, Rashford should start up there over Martial. David De Gea; Antonio Valencia, Chris Smalling, Eric Bailly, Ashley Young; Nemanja Matic, Ander Herrera, Paul Pogba; Alexis Sanchez, Romelu Lukaku, Jesse Lingard. A win will take us joint top with Arsenal for the most number of FA Cups won. It will be a tough game but I back us to win this one. I'm going for a 2-0 United win. Jose Mourinho master class with Sanchez and Lukaku scoring for us.